Earnings season kicks into high gear this week, which means that we’ll start to find out whether investors really are content with zero percent profit growth for now on the expectation that corporate executives will provide an optimistic outlook for the second half of the year. Plus, the glass-half-full crew will point out that flat earnings when economic growth is moderating isn’t that bad, especially considering that profits last year were juiced by the big corporate tax cuts in the U.S. There something else to bear in mind, according to the strategists at Richardson GMP. “If we have learned anything over the years, U.S. companies are very good at making sure analysts’ estimates are beatable,” they wrote in a research note Monday. “The positive surprise rate has been averaging 60 (percent to) 70 (percent) for some time now. Guess everyone took the ‘better to under promise and over deliver’ to heart.” Here’s the thing: the S&P 500 Index on Friday rose above 2,900, a level that represents the average year-end forecast from 25 firms tracked by Bloomberg. 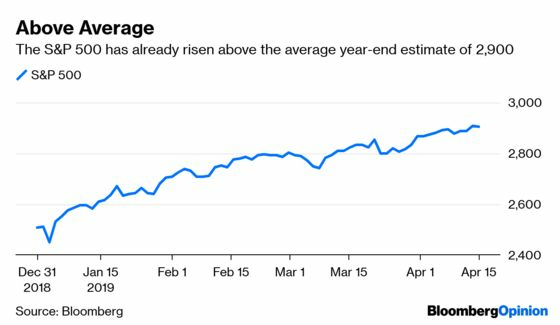 Only three times during the last two decades has the S&P 500 surpassed the year-end target this early: 2012, 2013 and 2017, according to Bloomberg News’s Lu Wang. The question is, will companies guide earnings forecasts for the rest of the year up by enough to justify current valuations? Markets are starting to become concerned again that volatility is too low across asset classes, triggering another “volmageddon” like the one in early February 2018. That’s when an extreme amount of bets on tranquil markets were quickly reversed, causing a broad sell-off in riskier financial assets such as stocks and corporate bonds. Morgan Stanley for one is warning that the current level of low volatility can’t last at historic lows much lower. “There are still two things that argue against the current levels of volatility being correct or sustainable,” the firm’s cross-asset strategist Andrew Sheets told Bloomberg News’s Joanna Ossinger. “The first is that market liquidity is still not great. The second: I’m not sure that the market in its newfound optimism has taken the story to the logical conclusion” about where asset prices are headed, he said. 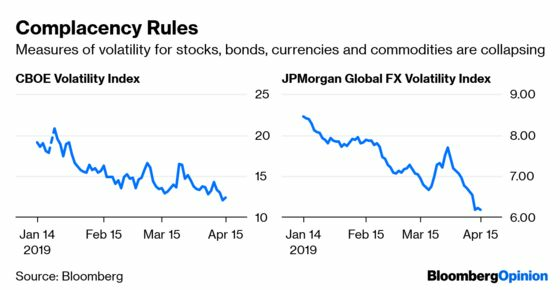 It’s no secret why volatility across all asset classes is back to being so low: the dovish shift from global central banks, increased economic stimulus from China and easing trade tensions. But as Ossinger reports, a disconnect between the growth in financial market size over the past decade and the capacity of banks to take on risk — which hasn’t kept pace — could exacerbate any sell-offs. Complacent market participants who equate a Federal Reserve on hold with low volatility is also an issue, and big price moves could soon surprise, Sheets said. The U.S.-China trade war can’t end soon enough for soy farmers. Total U.S. soybean exports fell to 460,700 metric tons last week from 888,700 tons the previous week and just above 446,500 tons in the same week a year ago, according to weekly inspection data released by the U.S. Department of Agriculture on Monday. The fact that shipments are now at their lowest level since before the trade war began could be a worrisome sign for growers hoping China might accelerate purchases ahead of a trade deal, according to Bloomberg News’s Michael Hirtzer and Dominic Carey. Of the soy shipments last week, 130,200 tons were loaded for China. Some U.S. farm groups are concerned that the Trump administration would accept Chinese purchase target pledges on a host of agriculture products without a promise to lift retaliatory tariffs. “This is of great concern to producers out here facing another year of tariffs,” Mark Powers, president of the Northwest Horticultural Council, which represents cherry, pear and apple growers in the Pacific Northwest, told Bloomberg News. “We’re disappointed. 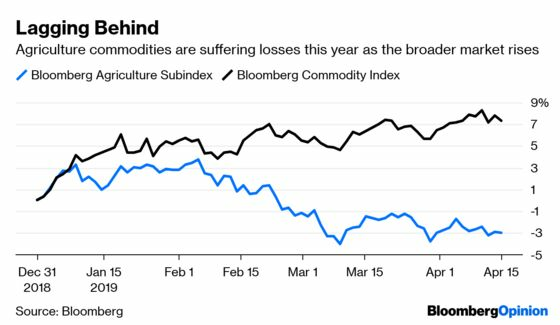 Clearly the priority lies elsewhere.” The Bloomberg Agriculture Subindex has fallen 2.97 percent this year, compared with a gain of 7.32 percent for the broader Bloomberg Commodity Index. The big winner in the currency market Monday was the South Korean won. The currency strengthened as much as 0.65 percent, the most since January. The won’s appreciation came as South Korean President Moon Jae-in said it’s time to prepare for talks with North Korean leader Kim Jong Un. 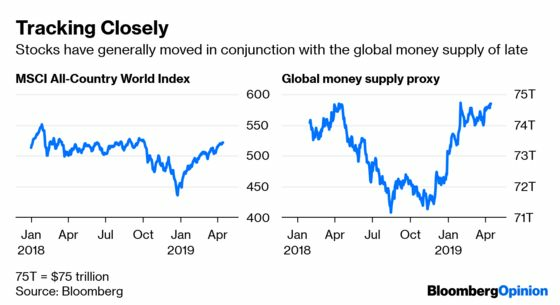 In many ways, it’s as if Moon was taking a page from the Trump administration’s playbook on market tactics, coming out and making statements that investors would view favorably when things look bleak. It’s also notable that Moon spoke just days after returning from a visit to the White House where he tried to get faltering nuclear negotiations back on track. 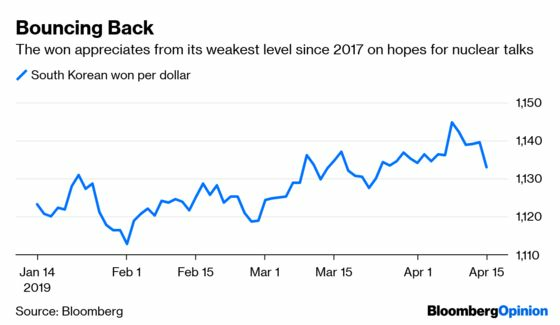 It’s also notable that the won last week weakened to its lowest against the dollar since 2017. Moon, who has tried to be a bridge between Kim and President Donald Trump, said that North Korea’s leader is committed to denuclearization and that the U.S. president feels a top-down peace process is necessary for the divided peninsula, according to Bloomberg News’s Youkyung Lee. Kim and Trump’s February summit collapsed without a deal, with both sides blaming the other for the breakdown. South Korea’s benchmark Kospi index of stocks also rose, rallying 0.42 percent even as the MSCI Emerging Markets Index fell as much as 0.33 percent. On Wednesday, April 17 at 11 am New York time, Bloomberg News will roll out Authers' Notes, its first Book Club live blog. Bloomberg Senior Editor John Authers, Bloomberg Markets Magazine Editor Christine Harper and Wall Street Journal Columnist Jason Zweig will be discussing Capital Ideas: The Improbable Origins of Modern Wall Street by Peter Bernstein. Bloomberg clients will be able to interact by sending questions and comments to authersnotes@bloomberg.net and follow the event on TLIV .